Test drive our beta app. Be the first to access our Wellness Experts and low prices. We're starting with a holistic approach. We call it "OM Wellbeing" because you get a team of experts who are available 24/7 for your emotional and physical wellbeing. 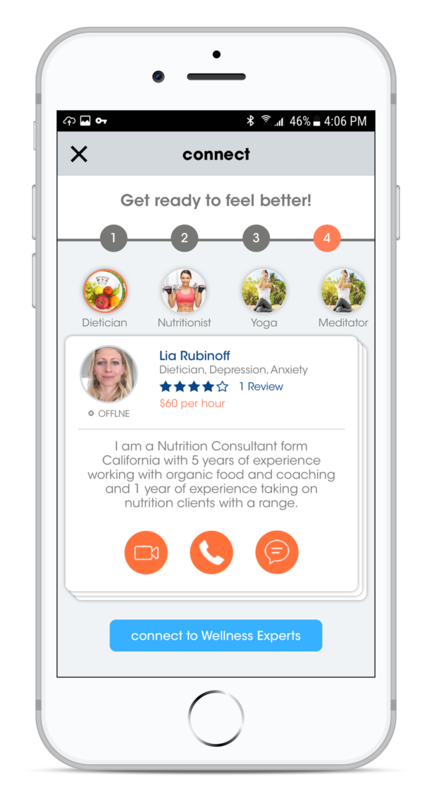 Get live, confidential support from our qualified therapists, nutritionists, fitness coaches, life coaches and more. Our professionals are always on-call. 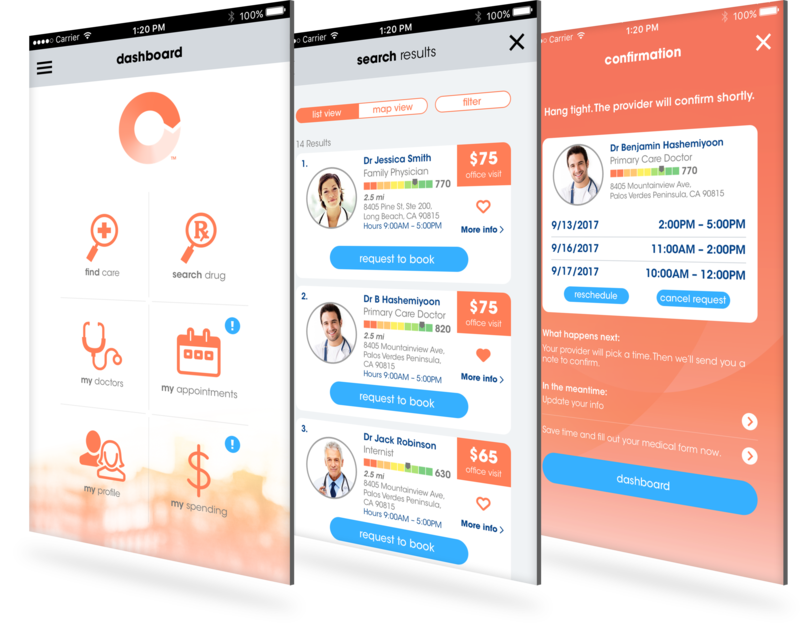 Join now to be part of our beta and one of the first to experience what it's like when we take the middleman out of healthcare. In accordance with the Digital Millennium Copyright Act, we’ve adopted the policy below toward copyright infringement. We reserve the right to (1) block access to or remove material that we believe in good faith to be copyrighted material that has been illegally copied and distributed by any of our advertisers, affiliates, content providers, members or users and (2) remove and discontinue service to repeat offenders. A statement that the information provided is accurate and, under penalty of perjury, the notifying party is authorized to make act on behalf of the copyright owner. Content provider's name, address, telephone number, and, if available, email address, and a statement that such person or entity consents to the jurisdiction of the Federal District Court for the judicial district in which the content provider’s address is located, or, if the content provider's address is located outside the United States, for any judicial district in which OM Healthcare is located, and that such person or entity will accept service of process from the person who provided notification of the alleged infringement or that’s person’s agent. If a counter-notice is received by the Designated Agent, OM Healthcare shall send a copy of the counter-notice to the original complaining party informing that person that OM Healthcare may replace the removed material or cease disabling it in 10 business days. OM Healthcare may replace the removed material and cease disabling access to it at least 10, but not more than 14, business days following receipt of the counter notice, unless our Designated Agent first receives notice from the complaining party that the complaining party has filed an action seeking a court order to restrain the user from engaging in infringing activity relating to the material on the Service. Welcome to OM Healthcare. Please read on to learn the rules and restrictions that govern your use of the OM Healthcare application, our website, and the products and services offered in connection with both (the “Services”). If you have any questions, comments, or concerns regarding these terms or the Services, please contact us at support@omhealthcare.com or 65 Pine Ave., Ste 370, Long Beach, CA 90802. Unless otherwise agreed by OM Healthcare, the Services described in these Terms are solely offered within the United States of America, and you may not use the Services if you are located in any other country. We are constantly trying to improve our Services, so these Terms may need to change along with the Services. 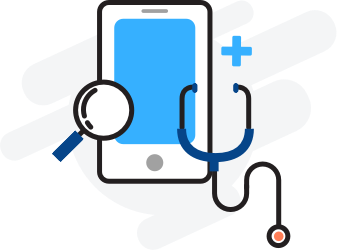 We reserve the right to change the Terms at any time, but if we do, we will bring it to your attention by placing a notice on the [OM Healthcare mobile application], by sending you an email, and/or by some other means. The Children’s Online Privacy Protection Act (“COPPA”) requires that online service providers obtain parental consent before they knowingly collect personally identifiable information online from children who are under 13. We do not knowingly collect or solicit personally identifiable information from children under 13; if you are a child under 13, please do not attempt to register for the Services or send any personal information about yourself to us. If we learn we have collected personal information from a child under 13, we will delete that information as quickly as possible. If you believe that a child under the age of 13 may have provided us personal information, please contact us at support@omhealthcare.com, or at our address, 65 Pine Ave., Ste 370, Long Beach, CA 90802. What are the basics of using OM Healthcare’s Services? You will be required to sign up for an account, and select a password and user name (“OM Healthcare User ID”). You promise to provide us with accurate, complete, and updated registration information about yourself. You may not select as your OM Healthcare User ID a name that you don’t have the right to use, or another person’s name with the intent to impersonate that person. You may not transfer your account to anyone else without our prior written permission. You will only use the Services for your own personal, non-commercial use, and not on behalf of or for the benefit of any third party, and only in a manner that complies with all laws that apply to you. If your use of the Services is prohibited by applicable laws, then you aren’t authorized to use the Services. We can’t and won’t be responsible for your using the Services in a way that breaks the law. How do OM Healthcare Services Work? OM Healthcare Services provide you with the ability to engage in real-time counseling sessions with non-licensed counselors, including but not limited to, life coaches, social workers, meditation and yoga experts (“OM Healthcare Counselors,” and the sessions with them, “OM Healthcare Sessions”) and licensed therapists, including but not limited to, psychologists, clinical counselors, marriage and family therapists (“Therapists,” and the sessions with them, “Therapist Sessions”). “Counselors” means both OM Healthcare Counselors and Therapists. “Counseling Sessions” means both OM Healthcare Sessions and Therapist Sessions. You are responsible for choosing your own Counselor. OM Healthcare makes reasonable efforts to ensure that Counselors only participate in the Services if they hold all active licenses required by law to provide the applicable advice each is approved to provide on the Services. Note that OM Healthcare (a) does not recommend or endorse any specific Counselor and (b) does not make any representations or warranties with respect to these Counselors or the quality of the Counseling Sessions they may provide. OM Healthcare itself does not offer, and the Services do not constitute, medical or healthcare advice or services and no physician-patient relationship with OM Healthcare or any of its employees, officers, or agents is created or implied by you accessing or using the Service. OM Healthcare is not an insurer and does not provide insurance for any healthcare products or services. You should always seek the advice of a physician or other qualified healthcare provider who you personally know before starting, stopping, or modifying any treatment or medication. You understand that OM Healthcare Services Are Not a Substitute for Emergency Services. OM HEALTHCARE SHOULD NEVER BE USED AS A SUBSTITUTE FOR EMERGENCY CARE. IF YOU HAVE A MEDICAL OR MENTAL HEALTH EMERGENCY, ARE THINKING ABOUT SUICIDE OR TAKING ACTIONS THAT MAY CAUSE HARM TO YOU OR TO OTHERS, YOU SHOULD SEEK EMERGENCY TREATMENT AT THE NEAREST EMERGENCY ROOM OR DIAL 911. You acknowledge and understand that Counselors are only providing limited, non-emergency services and are not a substitute for seeking the advice of your primary care physician or other qualified healthcare professional. You acknowledge and understand that you should never delay seeking treatment from your primary care physician or other qualified healthcare professional if advised by a Counselor. Encourages or promotes any activity that violates these Terms. A violation of any of the foregoing is grounds for termination of your right to use or access the Services and could result in Om Healthcare taking legal action against you. What are my rights in OM Healthcare’s Services? The materials displayed or performed or available on or through the Services, including, but not limited to, text, graphics, data, articles, photos, images, illustrations, User Submissions, and so forth (all of the foregoing, the “Content”) are protected by copyright and/or other intellectual property laws. You promise to abide by all copyright notices, trademark rules, information, and restrictions contained in any Content you access through the Services, and you won’t use, copy, reproduce, modify, translate, publish, broadcast, transmit, distribute, perform, upload, display, license, sell or otherwise exploit for any purpose any Content not owned by you, (i) without the prior consent of the owner of that Content or (ii) in a way that violates someone else’s (including OM Healthcare’s) rights. You understand that OM Healthcare owns the Services. You won’t modify, publish, transmit, participate in the transfer or sale of, reproduce (except as expressly provided in this Section), create derivative works based on, or otherwise exploit any of the Services. Do I have to grant any licenses to OM Healthcare or to other users? For all User Submissions,you hereby grant OM Healthcare a license to translate, modify (for technical purposes, for example making sure your content is viewable on an iPhone as well as a computer) and reproduce and otherwise act with respect to such User Submissions, in each case to enable us to operate the Services, as described in more detail below. This is a license only – your ownership in User Submissions is not affected. If you store a User Submission in your own personal OM Healthcare account, in a manner that is not viewable by any other user except you (a “Personal User Submission”), you grant OM Healthcare the license above, as well as a license to display, perform, and distribute your Personal User Submission for the sole purpose of making that Personal User Submission accessible to you and providing the Services necessary to do so. If you share a User Submission only in a manner that only certain specified users can view (for example, a private message from you to a Counselor) (a “Limited Audience User Submission”), then you grant OM Healthcare the licenses above, as well as a license to display, perform, and distribute your Limited Audience User Submission for the sole purpose of making that Limited Audience User Submission accessible to such other specified users, and providing the Services necessary to do so. Also, you grant such other specified users a license to access that Limited Audience User Submission, and to use and exercise all rights in it, as permitted by the functionality of the Services. If you share a User Submission publicly on the Services and/or in a manner that more than just you or certain specified users can view (such as a reviewing a Counseling Session), or if you provide us (in a direct email or otherwise) with any feedback, suggestions, improvements, enhancements, and/or feature requests relating to the Services (each of the foregoing, a “Public User Submission”), then you grant OM Healthcare the licenses above, as well as a license to display, perform, and distribute your Public User Submission for the purpose of making that Public User Submission accessible to all OM Healthcare users and providing the Services necessary to do so, as well as all other rights necessary to use and exercise all rights in that Public User Submission in connection with the Services and/or otherwise in connection with OM Healthcare’s business for any purpose. Also, you grant all other users of the Services a license to access that Public User Submission, and to use and exercise all rights in it, as permitted by the functionality of the Services. Please be aware that your Public User Submissions are not deemed “protected health information” under HIPAA. You agree that the licenses you grant are royalty-free, perpetual, sublicenseable, irrevocable, and worldwide, provided that when you delete your OM Healthcare account, we will stop displaying your User Submissions (other than Public User Submissions, which may remain fully available) to other users (if applicable), but you understand and agree that it may not be possible to completely delete that content from OM Healthcare’s records, and that your User Submissions may remain viewable elsewhere to the extent that they were copied or stored by other users. Finally, you understand and agree that OM Healthcare, in performing the required technical steps to provide the Services to our users (including you), may need to make changes to your User Submissions to conform and adapt those User Submissions to the technical requirements of connection networks, devices, services, or media, and the foregoing licenses include the rights to do so. How long will OM Healthcare store my Content? Certain Counselors may be required by law to retain health records they create in connection with the Services for a certain period of time. However, OM Healthcare is not a health care provider, and such obligations do not apply directly to it, and OM Healthcare cannot prevent any Counselor from deleting or modifying any of its own records on the Services. You agree that OM Healthcare has no responsibility or liability for the deletion or failure to store any data or other content maintained or posted to the Service. You may have heard of the Digital Millennium Copyright Act (the “DMCA”), as it relates to online service providers, like OM Healthcare, being asked to remove material that allegedly violates someone’s copyright. We respect others’ intellectual property rights, and we reserve the right to delete or disable Content alleged to be infringing, and to terminate the accounts of repeat alleged infringers; to review our complete Copyright Dispute Policy and learn how to report potentially infringing content, click here [insert link to Copyright Dispute Policy]. To learn more about the DMCA, click here. Your interactions with organizations and/or individuals found on or through the Services, including payment and delivery of goods or services, and any other terms, conditions, warranties or representations associated with such dealings, are solely between you and such organizations and/or individuals. You should make whatever investigation you feel necessary or appropriate before proceeding with any online or offline transaction with any of these third parties. You agree that OM Healthcare shall not be responsible or liable for any loss or damage of any sort incurred as the result of any such dealings. Will OM Healthcare ever change the Services? Does OM Healthcare cost anything? The fee for each Counseling Session (“Counseling Fee”) will be explicitly stated prior to your initiating the applicable Counseling Session, and you are required to pay such Counseling Fee, as well as all applicable fees, as described on the Services. Your account may be associated with a company or organization that you work with or consult for (your “Organization”). That Organization may be paying fees to OM Healthcare for your use of the Services. You understand and agree that if your Organization fails to pay those fees and/or its agreement with OM Healthcare related to the Services (the “Organization Agreement”) terminates, your OM Healthcare account may be suspended and/or these Terms may terminate. Certain Counseling Sessions (for example, Counseling Sessions with Therapists versus OM Healthcares) may not be covered by your Organization’s subscription; if you choose to initiate a Counseling Session that is not covered by your Organization’s subscription, you will be informed prior to initiating such Counseling Session, and you will be required to pay the applicable Counseling Fee yourself. If you are an Organization, you will be charged an annual subscription, based on the number of employees and/or contractors you authorize under your Organization account, as further described in the [Subscription Terms.][link]. Unless otherwise specified, the following terms apply to all purchases. Payment Method. We may use a third-party payment processor (the “Payment Processor”) to bill you through a payment account, such as your bank account or debit or credit card, linked to your account on the Services (your “Billing Account”). The processing of payments will be subject to the terms, conditions and privacy policies of the Payment Processor in addition to these Terms. We are not responsible for error by the Payment Processor. By choosing to purchase Counseling Sessions, you agree to pay us, through the Payment Processor, all charges at the prices then in effect for such Counseling Session in accordance with the applicable payment terms and you authorize us, through the Payment Processor, to charge your chosen payment provider (your “Payment Method”). You agree to make payment using that selected Payment Method and to provide current, complete and accurate information for your billing account. You must promptly update all information to keep your billing account current, complete and accurate (such as a change in billing address, credit card number or credit card expiration date). You must promptly notify us or our payment processor if your payment method is canceled (e.g., for loss or theft) or if you become aware of a potential breach of security, such as the unauthorized disclosure or use of your user name or password. Insurance Coverage. At this time, OM Healthcare is unable to accept insurance as payment for any Services. Please inquire with your insurance provider if you believe you may be entitled to reimbursement from the provider in connection with your payments to OM Healthcare. What if I want to stop using OM Healthcare’s Services? OM Healthcare is also free to terminate (or suspend access to) your use of the Services or your account, for any reason in our discretion, including your breach of these Terms. Also, if your account is associated with an Organization (as described above), OM Healthcare may terminate (or suspend access to) your use of the Services account if (a) the Organization Agreement terminates, (b) you no longer have an employment or consulting relationship with the Organization, or (c) Organization directs us to do so. OM Healthcare has the sole right to decide whether you are in violation of any of the restrictions set forth in these Terms. Account termination may result in destruction of any Content associated with your account, so keep that in mind before you decide to terminate your account. We will try to provide advance notice to you prior to our terminating your account so that you are able to retrieve any important User Submissions you may have stored in your account (to the extent allowed by law and these Terms), but we may not do so if we determine it would be impractical, illegal, not in the interest of someone’s safety or security, or otherwise harmful to the rights or property of OM Healthcare. If you have deleted your account by mistake, contact us immediately at support@omhealthcare.com, or at our corporate address, 65 Pine Ave., Ste 370, Long Beach, CA 90802; we will try to help, but unfortunately, we can’t promise that we can recover or restore anything. 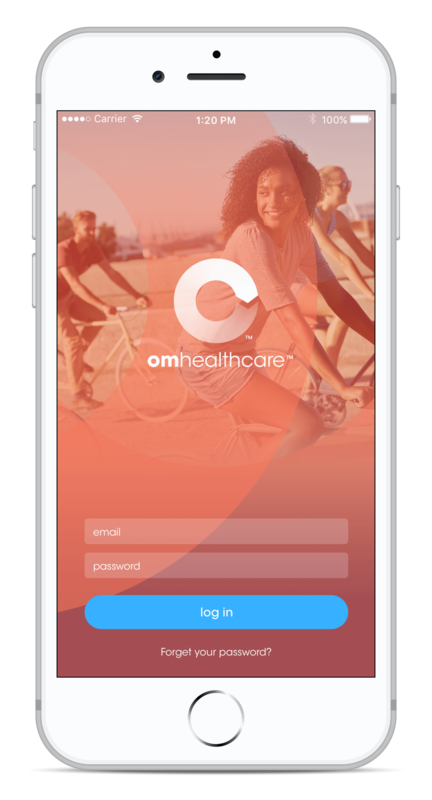 I use the OM Healthcare App available via the Apple App Store – should I know anything about that? Both you and OM Healthcare acknowledge and agree that Apple and Apple’s subsidiaries are third party beneficiaries of these Terms, and that upon your acceptance of these Terms, Apple will have the right (and will be deemed to have accepted the right) to enforce these Terms against you as the third party beneficiary hereof. Warranty Disclaimer. Neither OM Healthcare nor its licensors or suppliers makes any representations or warranties concerning any content contained in or accessed through the Services, and we will not be responsible or liable for the accuracy, copyright compliance, legality, or decency of material contained in or accessed through the Services. We make no representations or warranties with respect to professional qualifications, expertise, or quality of work and in no event shall we be liable to you for any decision made or action taken in reliance on any content available through the Services. We (and our licensors and suppliers) make no representations or warranties regarding suggestions or recommendations of services or products offered or purchased through the Services (including Counseling Sessions). Products and services purchased or offered (whether or not following such recommendations and suggestions) through the Services are provided “AS IS” and without any warranty of any kind from OM Healthcare. THE SERVICES AND CONTENT ARE PROVIDED BY OM HEALTHCARE (AND ITS LICENSORS AND SUPPLIERS) ON AN “AS-IS” BASIS, WITHOUT WARRANTIES OF ANY KIND, EITHER EXPRESS OR IMPLIED, INCLUDING, WITHOUT LIMITATION, IMPLIED WARRANTIES OF MERCHANTABILITY, FITNESS FOR A PARTICULAR PURPOSE, NON-INFRINGEMENT, OR THAT USE OF THE SERVICES WILL BE UNINTERRUPTED OR ERROR-FREE. SOME STATES DO NOT ALLOW LIMITATIONS ON HOW LONG AN IMPLIED WARRANTY LASTS, SO THE ABOVE LIMITATIONS MAY NOT APPLY TO YOU. Limitation of Liability. TO THE FULLEST EXTENT ALLOWED BY APPLICABLE LAW, UNDER NO CIRCUMSTANCES AND UNDER NO LEGAL THEORY (INCLUDING, WITHOUT LIMITATION, TORT, CONTRACT, STRICT LIABILITY, OR OTHERWISE) SHALL OM HEALTHCARE (OR ITS LICENSORS OR SUPPLIERS) BE LIABLE TO YOU OR TO ANY OTHER PERSON FOR (A) ANY INDIRECT, SPECIAL, INCIDENTAL, OR CONSEQUENTIAL DAMAGES OF ANY KIND, INCLUDING DAMAGES FOR LOST PROFITS, LOSS OF GOODWILL, WORK STOPPAGE, ACCURACY OF RESULTS, OR COMPUTER FAILURE OR MALFUNCTION, OR (B) ANY AMOUNT, IN THE AGGREGATE, IN EXCESS OF THE GREATER OF (I) $100 OR (II) THE AMOUNTS PAID BY YOU TO OM HEALTHCARE IN CONNECTION WITH THE SERVICES IN THE TWELVE (12) MONTH PERIOD PRECEDING THIS APPLICABLE CLAIM, OR (C) ANY MATTER BEYOND OUR REASONABLE CONTROL. SOME STATES DO NOT ALLOW THE EXCLUSION OR LIMITATION OF CERTAIN DAMAGES, SO THE ABOVE LIMITATION AND EXCLUSIONS MAY NOT APPLY TO YOU. Indemnity. To the fullest extent allowed by applicable law, you agree to indemnify and hold OM Healthcare, its affiliates, officers, agents, employees, and partners harmless from and against any and all claims, liabilities, damages (actual and consequential), losses and expenses (including attorneys’ fees) arising from or in any way related to any third party claims relating to (a) your use of the Services (including any actions taken by a third party using your account), and (b) your violation of these Terms. Assignment. You may not assign, delegate or transfer these Terms or your rights or obligations hereunder, or your Services account, in any way (by operation of law or otherwise) without OM Healthcare’s prior written consent. We may transfer, assign, or delegate these Terms and our rights and obligations without consent. Choice of Law; Arbitration. These Terms are governed by and will be construed under the laws of the State of California, without regard to the conflicts of laws provisions thereof. Any dispute arising from or relating to the subject matter of these Terms shall be finally settled in San Francisco County, California, in English, in accordance with the Streamlined Arbitration Rules and Procedures of Judicial Arbitration and Mediation Services, Inc. (“JAMS”) then in effect, by one commercial arbitrator with substantial experience in resolving intellectual property and commercial contract disputes, who shall be selected from the appropriate list of JAMS arbitrators in accordance with such Rules. Judgment upon the award rendered by such arbitrator may be entered in any court of competent jurisdiction. Notwithstanding the foregoing obligation to arbitrate disputes, each party shall have the right to pursue injunctive or other equitable relief at any time, from any court of competent jurisdiction. For all purposes of these Terms, the parties consent to exclusive jurisdiction and venue in the state or federal courts located in, respectively, San Francisco County, California, or the Northern District of California. Miscellaneous. You will be responsible for paying, withholding, filing, and reporting all taxes, duties, and other governmental assessments associated with your activity in connection with the Services, provided that the OM Healthcare may, in its sole discretion, do any of the foregoing on your behalf or for itself as it sees fit. The failure of either you or us to exercise, in any way, any right herein shall not be deemed a waiver of any further rights hereunder. If any provision of these Terms is found to be unenforceable or invalid, that provision will be limited or eliminated, to the minimum extent necessary, so that these Terms shall otherwise remain in full force and effect and enforceable. You and OM Healthcare agree that these Terms are the complete and exclusive statement of the mutual understanding between you and OM Healthcare, and that it supersedes and cancels all previous written and oral agreements, communications and other understandings relating to the subject matter of these Terms. You hereby acknowledge and agree that you are not an employee, agent, partner, or joint venture of OM Healthcare, and you do not have any authority of any kind to bind OM Healthcare in any respect whatsoever. Except as expressly set forth in the section above regarding the Apple Application, you and OM Healthcare agree there are no third-party beneficiaries intended under these Terms. What Information does OM Healthcare Collect? We receive and store any information you knowingly provide to us. Information that you provide while using the Services, for example information provided at the time of creating an account and/or through your account settings, such as your full name, age, date of birth, email address, mailing address, phone number, payment and account information, employer issued id if logging in through employer program and third-party account credentials (for example, your log-in credentials for Facebook, Google, or other third-party sites). Information that you provide when searching for information and engaging with Providers. Information you post, upload, display, transmit to other users, or otherwise make available on the Services. Information you authorize us to access from any External Source. Information we may request when you report a problem with the Services. Details of transactions you carry out on and services you receive through the Services. You may be required to provide financial information before accessing available services through the Services. With your permission, information stored on your mobile device, such as photos, or access resources on your mobile device, such as the camera. Certain purchases through the Services may require that you provide financial account information, such as your credit card number, to our third-party service providers. We may communicate with you if you’ve provided us the means to do so. For example, if you’ve given us your email address, we may send you promotional email offers on behalf of other businesses, or email you about your use of the Services. If you do not want to receive communications from us, please indicate your preference by contacting us at support@omhealthcare.com. Will OM Healthcare Share Any of the Personal Information it Receives? Counselors. We will disclose your Personal Information to your selected Counselor to enable you to use our Services. Information that’s been de-identified. We may de-identify your Personal Information so that you are not identified as an individual, and provide that information to our partners. 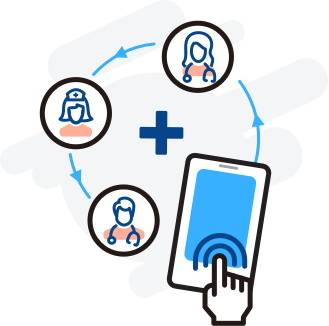 We may also provide aggregate usage information to our partners (or allow partners to collect that information from you), who may use such information to understand how often and in what ways people use our Services, so that they, too, can provide you with an optimal user experience. However, we never disclose aggregate usage or de-identified information to a partner (or allow a partner to collect such information) in a manner that would identify you as an individual person. We may deliver a file to you through the Services (known as a “web beacon”) from an ad network. Web beacons allow ad networks to provide anonymized, aggregated auditing, research and reporting for us and for advertisers. Web beacons also enable ad networks to serve targeted advertisements to you when you visit other websites. Because your web browser must request these advertisements and web beacons from the ad network’s servers, these companies can view, edit, or set their own cookies, just as if you had requested a web page from their site. You may be able to opt-out of web beacon tracking conducted by third parties through our Services by adjusting the Do Not Track settings on your browser; however, please note that we don’t control whether or how these third parties comply with Do Not Track requests. Affiliated Businesses. In certain situations, businesses or third-party websites we’re affiliated with may sell or provide products or services to you through or in connection with the Services (either alone or jointly with us). You can recognize when an affiliated business is associated with such a transaction or service, and we will share your Personal Information with that affiliated business only to the extent that it is related to such transaction or service. We have no control over the policies and practices of third party websites or businesses as to privacy or anything else, so if you choose to take part in any transaction or service relating to an affiliated website or business, please review all such business’ or websites’ policies. User Profiles and Submissions. Depending on your privacy settings, certain user profile information, including your name, location, and any video or image content that you have uploaded to the Services, may be displayed to other users to facilitate user interaction within the Services or address your request for our services. For example, you may be able to publicly rate or review a Counselor, and your user name and photo may be visible to other users in such review. Please remember that any content you voluntarily disclose online in a manner other users can view (on discussion boards, in messages and chat areas, in reviews, etc.) becomes publicly available, and can be collected and used by anyone. Your user name may also be displayed to other users if and when you send messages or comments or upload images or videos through the Services and other users can contact you through messages and comments. [Additionally, if you sign into the Services through an External Source, your list of “friends” from that site or service may be automatically imported to the Services, and such “friends,” if they are also registered users of the Services, may be able to access certain non-public information you have entered in your Services user profile. Again, we do not control the policies and practices of any other third-party site or service. Business Transfers. We may disclose your Personal Information to a buyer or other successor in the event of a merger, divestiture, restructuring, reorganization, dissolution, or other sale or transfer of some or all of OM Healthcare’s assets, whether as a going concern or as part of bankruptcy, liquidation, or similar proceeding, in which Personal Information held by OM Healthcare about users of the Services is among the assets transferred. Your account is protected by a password for your privacy and security. If you access your account via an External Source, you may have additional or different sign-on protections via that third party site or service. You must prevent unauthorized access to your account and Personal Information by selecting and protecting your password and/or other sign-on mechanism appropriately and limiting access to your computer or device and browser by signing off after you have finished accessing your account. Any transmission of your Personal Information is at your own risk. We are not responsible for circumvention of any privacy settings or security measures we provide. Our retention periods for your Personal Information are based on business needs and legal requirements. We retain your Personal Information for as long as is necessary for the purpose(s) for which the information was collected, and any other permissible, related purpose. For example, we may retain certain transaction details and correspondence until the time limit for claims arising from the transaction has expired. When we no longer need your Personal Information or aren’t otherwise required by law to retain such information, we either irreversibly anonymize the information (in which case, we may further retain and use the anonymized information) or securely destroy the information. The information you can view, update, and delete may change as the Services change. If you have any questions about viewing or updating information we have on file about you, please contact us at support@omhealthcare.com. Again, please note that information about you held in your counselor’s account is not modifiable or deleteable by you, except to the extent required by applicable law. Under California Civil Code Sections 1798.83-1798.84, California residents are entitled to contact us to prevent disclosure of Personal Information to third parties for such third parties’ direct marketing purposes; in order to submit such a request, please contact us at support@omhealthcare.com. You may be able to add, update, or delete information as explained above. When you update information, however, we may maintain a copy of the unrevised information in our records. [You may request deletion of your account by contacting support@omhealthcare.com. Some information may remain in our records after your deletion of such information from your account. We may use any aggregated data derived from or incorporating your Personal Information after you update or delete it, but not in a manner that would identify you personally. 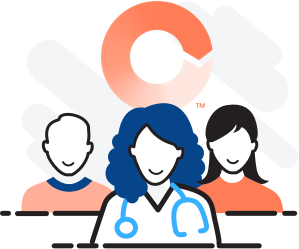 If you have any questions or concerns regarding our privacy policies, please send us a detailed message to support@omhealthcare.com and we will try to resolve your concerns.